Two years ago in late December Sean told me he got a hernia. I had to Google it immediately to figure out how serious it was and what should or could happen. If this were to happen to someone I loved here where I could see it with my own eyes and know they were under the care of a doctor I probably wouldn’t worry much. But this someone I love is in prison where going to medical takes hours of needless waiting, is a huge hassle and you can’t just go anytime during the day or night. I was worried. The hernia didn’t sound too bad. It was mostly uncomfortable and if not taken care of surgically it could become a bigger more serious issue. He told me that a couple other guys there he spoke to had also had a hernia, had the same type of surgery and were fine now. Apparently it is kind of common among men. Sean went to medical, a nurse referred him to see a doctor at a later time. Then. when he was seen by the doctor he had to make his hernia “pop back out” before she would do anything for him. 1/18/14 “I went to the doctor yesterday, without ‘seeing’ my hernia she didn’t want to do anything about it. Such ridiculousness. I knew if I was going to get anything done about it before it got worse I was going to have to make sure she saw it. So I went out and did nine sets of pull ups and two sets of dips.I did more pushups and dips while I waited for them to let me back in. By then my hernia was definitely showing and I was able to show the doctor. She recommended me for surgery.” He had to prove that he had a legitimate issue in order to be taken seriously. The surgeon he got to see later on could tell right away where the hernia was. The surgery was going to happen ‘sometime soon’, we just didn’t know exactly when for sure. We weren’t going to get to know. So any day now, he could be taken into surgery and nobody wouldn’t know about it until after the fact. This was unsettling, but at least he was getting treatment…? Sean was seen by a surgeon the week the surgery took place. It was going to be a pretty minor surgery where they would insert a mesh under the skin where the hernia was to fix it. They would be putting him under anesthesia for it. They said it would be sometime that week, still no definite date or time. It seemed strange to know the person I loved and cared about most was about to be taken to surgery at some hospital, and no one was even allowed to know where or when. The day of the surgery I knew he had gone in. Somehow I just knew. I prayed all day long. I sent him loving vibes. It made me sad to think of him, being transported from the prison to the hospital the morning of the surgery, knowing he was about to go under and that he wouldn’t have anyone there waiting for him when he woke up. No special treatment or tender loving care after he was let out of the hospital mere hours later, still groggy. If there had been any way at all that I could have been there even just to say hi as he was waking up in the hospital room and hold his hand, I would have. But there wasn’t. Nobody could be with him, we didn’t even get to know which hospital he was going to go to. 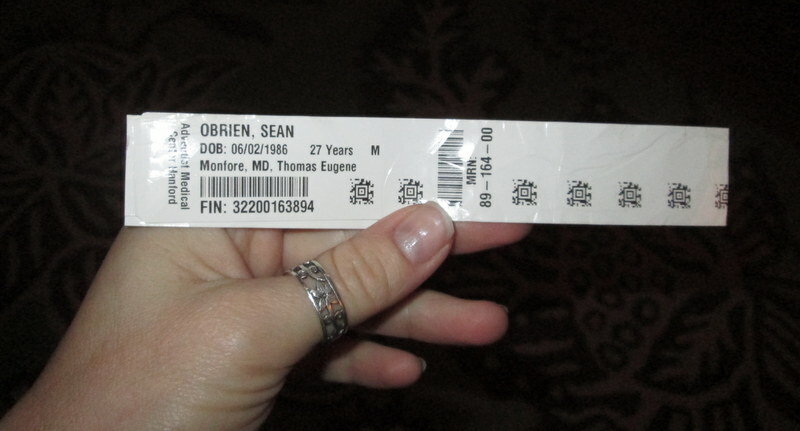 Sean was transported for surgery at 4:45 am on March 3rd. As soon as the nurses were sure he was fine he went right back into the prison. He called later on to let us know he was fine and it was all done. He sounded very tired but said he was in no pain. They were giving him pain pills, but he had to walk down to pill call in order to get them, which is weird. They would bring him his meal tray but not his medication for pain? I wished so badly that I could be there to take care of him. I would have given him ice cream for dinner. I would have curled up right next to him in his little hard bunk and rubbed his hair while I sang him songs.Yeah I know it’s really silly but when I think about the basic things that he is being robbed of it breaks my heart. Here is this totally sweet, funny, loving guy who has done nothing wrong, let alone anything deserving of spending 12 years behind bars, and they deny him such basic human comfort as to let us be there with him for an hour after he goes into surgery? It’s just not right. This entry was posted in wrongful conviction and tagged JLWOP, long distance relationships, prison, surgery. Bookmark the permalink.